Posted May 6, 2016 by admin & filed under General Dentistry. A dead tooth is simply a tooth that is no longer vital – it has lost its life supply. A dead tooth is a serious dental issue that must be addressed in order to prevent even further damage to the mouth. However, preventing a dead tooth from occurring in the first place is the most optimal solution, but that is not always possible. Dental trauma is one of the main causes of a dead tooth, and dental infection is the other most common cause. A tooth can die because it is a living component of your body, and understanding how it sustains life helps you understand how it can die. Dental decay and dental trauma are the two most common causes of a dead tooth. While a dental cavity is a small form of decay, it is still decay, and it must be dealt with in order to prevent more serious dental issues from occurring. Cavities that are left untreated will eventually allow an infection to reach the inner layers of the tooth where the nerve fibers and blood vessels are working to keep the tooth alive. As with all living tissues in the human body, the teeth must stay connected to blood vessels in order to sustain life. When an infection is allowed to go untreated and reach the pulp of the tooth, it can sever the blood vessels that attach the tooth to its life source, causing the tooth to die. This process happens over a period of time and has many indicators – pain and extreme sensitivity being just a couple. 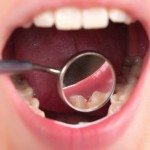 At no point should any dental concern be ignored because doing so can lead to the death of a tooth and open the pathway for a number of other serious issues. Dental trauma is a serious cause of a dead tooth, and it is one that happens most unexpectedly, causing emergency dental services to be needed. Trauma, injury, or blunt force to the face can cause the immediate death of a tooth. When a tooth is knocked out of the mouth or is knocked loose from its socket, the blood vessels that supply it life are instantly severed. Unless immediate dental intervention is performed and the tooth is able to reconnect with the blood vessels, the tooth will die. Wearing proper protection during sports and recreational activities can help to prevent a tooth from being damaged, but accidents and injuries can occur at inopportune times without warning. If you fear that you have a dead tooth, or you have any dental health concern, please contact Modern Family Dental Care today. We are here to help you achieve and maintain the healthiest mouth possible.